The EDP is my latest tool, combined with a midicontroler this looping device becomes an instrument of its own, fantastic improv-tool . I've used the loop function in my line6 dl4 for years, but this is something completely diffrent. 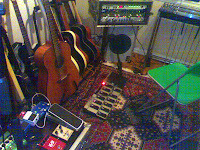 Ive incorporated into my live acoustic/pedal steel rack, giving me the oportunity to switch instruments while looping. Grammy to Thomas Dybdahl for "Science"